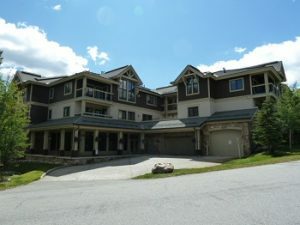 Tyra IV Riverbend Lodge Condo are ski in ski out condos in Breckenridge Real Estate. The Snowflake Lift located at the property will take owners and guests to the Breckenridge Ski Resort for skiing and riding. Tyra Riverbend Lodge Condo off of 4 O’Clock Road is only 3 short blocks to the historic Breckenridge Main Street where you can shop and dine. Built in 1999 there are 48 condos comprised of 17 – studios, 6 – one bedrooms, 11 – two bedrooms and 15 – three bedroom residences. These ski in ski out Breckenridge condos range in size from 308 – 1788 square feet. Each of these condos in Breckenridge Real Estate are designed with granite countertops, stone fireplaces, in unit washer and dryers and spacious decks with views of the babbling Sawmill Creek, Baldy Mountain and the Ten Mile Range. If you are looking for a Breckenridge condo with amenities look no further. The complex has a fitness room, hot tub, sauna, steam room, spacious lobby, garage parking, elevators, ski lockers and shuttle service to take you to town. When looking for a condo for sale in Breckenridge Real Estate that is ski in ski out and close to town, Tyra Riverbend Lodge Condo is a complex you will want to arrange to see in person. Arrange a time to view homes, townhomes and condos for sale in Breckenridge CO with the Knott’s today.